On Marlie’s first day of moving onto the Queen Charlotte Islands, her car has a flat tire. All her belongings are stuffed in the trunk on top of the tire changing equipment. Once removed, they don’t fit back into the trunk, but a passing islander stops to help change her tire and as the sky opens and rain threatens to soak everything, he offers to bring the excess belongings to Masset for her. “Okay, you go sit in the car and I’ll take care of the rest.” When she nodded, Brent grabbed a few things from the roadside and walked to the back of his truck. She was right behind him with an armful of odds and ends. Brent opened the canopy door and as she shrieked, he whirled around. “Oh my God! You killer!” Her face was contorted into a mask of horror. “You murderer! How could you kill that sweet little thing? Give me my stuff.” She tried to grab the bags from his hand but dropped what she was carrying. They both bent to pick the things up and bumped heads. “What the hell’s the matter with you?” Brent stared at her in disbelief. The popstar image was fading fast and she was looking more like one of those angry protestors he’d seen on TV. “Not everyone! Not me!” She picked up her things and stomped back to her car but there was no place to put anything. She threw him a disgusted look, frowned, shook her head. She opened the back door and punched and pushed and shoved her belongings, desperate to cram her things into the Corolla’s back seat. No room. She squeezed out a growl of frustration, and looked back at Brent again. Her shoulders sagged and that’s when the tears came. “Have to trust me?! Jeezus you’ve got some bloody nerve. What the hell would I want your stuff for?” Brent turned to get into the truck. “This is the only road that goes up or down the island, so you won’t lose sight of your boxes.” What does she think I’d do with a bunch of ladies’ clothes? Christ! What a loonie! How did I get myself mixed up with this nutcase? “The teachers’ trailer court,” she said. Find MARLIE on amazon and smashwords. “Love triangle”: an awkward situation when two people love the same third person. But doesn’t the triangle have three points and don’t they all connect to each other? Let’s say Michael and Karl (A and B) each love Julia (C). A and B each connect to C. What about that third connection, between A and B? Without that “rub” the world would be too rosy for C.
Julia and Michael are young and in love. 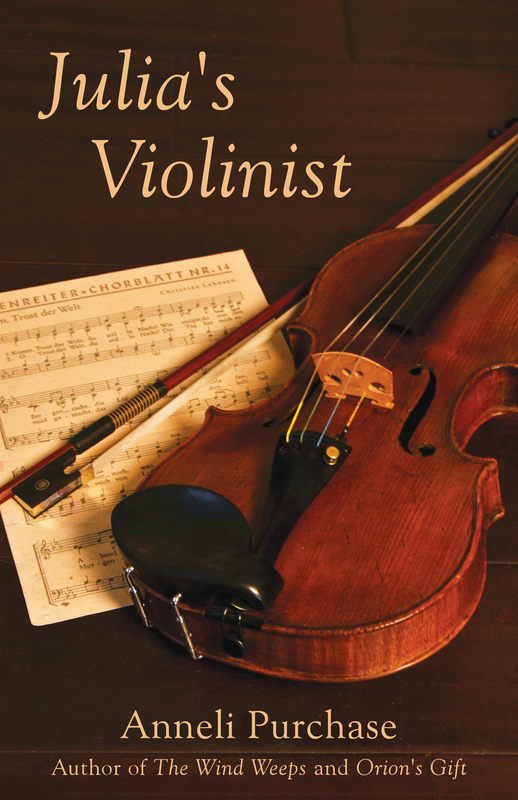 No one plays the violin as sweetly as Michael does. But circumstances interfere, the love affair ends, and Michael disappears. Julia marries someone else. Their two children are lovely, and life is grand. Then war in Europe changes everything. Alone with two small children, Julia suffers through desperate times. Her new suitor seems to be the answer to her problems. She marries again, perhaps more for security, although she does come to love him, and the two children they soon have together. But what happens when the bloom is off the rose and only thorns are left? What if, out of the blue, a letter finds her, and a voice from 20 years ago and now on the other side of the world asks her to come live with him? “I’m alive. I’ve searched for you through the Red Cross for years and am overjoyed to have found you at last. I’ve never stopped loving you. Please say you’ll come to me,” Michael writes. What would Karl say? Or do? Should she leave this thorny bed and flee to a bed of roses? But she can’t have Karl meet Michael, her beautiful violinist …. Abandon everyone, everything? Not her children, and another one on the way. How desperate is she? And what about the “rub” between the other two points of the triangle? It sounds so romantic to visit remote and naturally beautiful islands. Even more exciting to contemplate living there. It’s a man’s world: a place where fishing and logging take place. If you’re a woman, you know that fishermen and loggers are physically strong and capable, and to do these jobs in such remote places, they are probably mentally of strong character. They are working and have a paycheque. Hmm…. Might not one of these guys be a good catch for an adventurous single girl? Marlie is a pretty strong character herself, to undertake a big change in her life while still in her twenties. She has just landed a teaching job in Masset, in the Queen Charlotte Islands. Maybe she hopes to land a different prize as well. A friend takes her for a ride in his fish boat. She inhales the salty smell of the sea and notices that there isn’t a building or another person in sight. She has never experienced such solitude or felt so small against the elements. But she feels safe in the care of her friend. Eagles soar, deer and bears visit the beaches, killer whale fins slice the water. Humpback whales take care not to be near the killer whales, but put on a show of their own, leaping out of the water and landing on their sides, slapping the surface. Marlie can’t believe her good luck in coming to the islands. 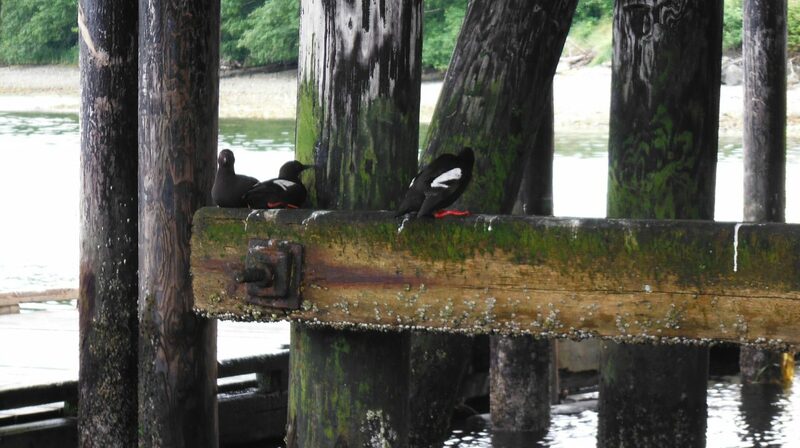 Beachcombing and birdwatching are amazing. But wait! Even this pure and distant place is not without its problems. In town, Marlie teaches her grade three class. She makes friends and gets to know people. But maybe she is too willing to overlook the danger signs in characters who are deception experts. She befriends an artist who pursues her, and misses some signals she should have picked up on. *** When you read about Marlie’s new life on the Queen Charlottes, brace yourself for some violent scenes. She will have some serious mending to do. A handsome fisherman is standing in the wings, but Marlie has learned to be careful, and, being new to the islands, has only herself to rely on. Will she find the inner strength to deal with her problems, or will she run back to the city and the messy life she thought she had left behind? Marlie is the third of three romantic suspense novels set on the British Columbia coast, but it also works well as a stand alone. If you would like to read the first two novels, you can download The Wind Weeps for free on Amazon and Smashwords.com, followed by Reckoning Tide and then Marlie. Reading Marlie first will not spoil the reading of The Wind Weeps and Reckoning Tide. You can find Marlie on all the Amazon sites. Just go to amazon.com or amazon.ca, or amazon.co.uk and type in Marlie. If you have an e-reader other than Kindle, you can find Marlie on Smashwords.com. It is affordably priced so as not to break the bank. Special thanks to my friend Jan Brown, who has kindly permitted me to use her painting for the cover of Marlie. Writers are never bored when they are left sitting in the car or in a room, waiting for a friend or an appointment. As long as we have a pen and paper we will be fine. Sometimes I play a “people watching” game using my notebook and this will help shape some of my characters when I have more time to write. When someone enters my line of vision, I think, “What is the thing I notice most about this person?” It might be some facial feature or other physical attribute, or it may be a piece of clothing or accessory, or the way the person moves. Whatever it is, the challenge is to jot down one or two keywords that stand out about this person, and to do it quickly, say within two or three seconds. If I take longer than that, I lose the spontaneity and it is no longer a valid first impression. Later, when I look at my keywords, more of that person’s description will probably come back to me. Sometimes I have agonized over descriptions of character in my novel, as I try hard not to have them all come out the same. It’s not enough to add details arbitrarily to a person’s outward appearance. These details have to suit the personality to make that person believable to the reader. For example: I shouldn’t simply decide that Joan could wear a new red hat or should have red striped socks. Perhaps Joan is shy and lacks self-confidence. In that case, she is unlikely to wear clothes or accessories that draw attention to herself. I might choose one of the examples in my notebook as a starting point and use the keywords to build a character in my mind. It may even be a combination of several examples. The more samples I have to choose from, the more interesting and accurately depicted my character will be. I can mix and match them if they suit the kind of person I need for my novel. Once I have a collection of keywords for my people, I can juggle them around to build unique characters. For me, it is works best to put the new character’s attributes all on one page when I’m ready to create him or her. There are character profile sheets available on the Internet. I can easily fill in the keywords once my imaginary person is created. That way I can refer to the details later on and not give Joan blue eyes in Chapter 21 when she had brown eyes in Chapter 2. Believe me, I’ve done that. Now, see how easy and fun building character can be? Where do we get our ideas for writing? We’ve all heard the advice to “write what you know,” but we don’t want to end up with a memoir either – not when we set out to write a novel. Looking back at the five novels I’ve written, I realized that I often took a germ of an idea or an event or experience from my own life and built it into my books. The trick is not to write the whole experience, but use it as a jumping off point. Here is an example. In my book, Reckoning Tide (the sequel to The Wind Weeps), I needed to create an incident that had tension and danger and a resolution. The characters, Jim and Andrea, are in a remote inlet on the coast of British Columbia. They have taken the skiff from their fishing troller and have gone partway up the river to explore. Just as my husband (the Captain) and I did many years ago, Jim and Andrea tied the skiff to an upturned tree root and walked along the tidal flats. I was terrified of grizzlies that might be coming to the river mouth to eat salmon. I should have worried more about getting separated from the skiff by the incoming tide. The setting in Khutz Inlet is such that all sorts of danger come with its beauty. Rather than tell my own story in the novel, I used what I knew about the place (the sights, the smells, the danger) to create the final chapters of my novel. Have you used some of your own experiences as a jumping off point for a scene in your novel? If not, why not try it? 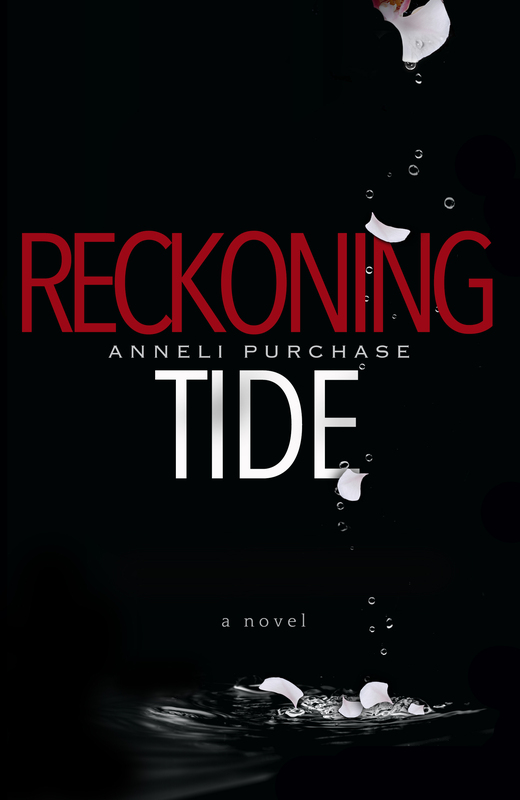 To see how I have used that experience in my novel, you can read Reckoning Tide. But first, you should read The Wind Weeps (which is free to download). Just click on the book cover images on the left sidebar to download. Is Your Writing Feeble or Fabulous? As well as my first four novels, I have now written “Marlie,” a third novel of romantic suspense that takes place in the Queen Charlotte Islands. It follows “The Wind Weeps” (a free download), and “Reckoning Tide,” but is a stand-alone novel.